As I was growing up I was never a huge fan of cricket despite being born to a cricket-crazy mother. It all started in the 90s when I met my husband, then my boy friend, who as I have mentioned before breathes cricket. Since I began to spend more and more time with him, my knowledge about the game grew too, and I started to evince some interest. And it was during this time that a tall, slim, bespectacled man started to make foray into the game. My interest (and definitely not passion) in the game is intrinsically linked to the rise of Anil Kumble, who went on to become the country's most successful bowler. I am not sure what was it about Anil Kumble that struck me from the word go. Just like Steve Waugh I think it was the never-say-die attitude that he brought to the field or maybe his commitment to the game; he was the man you could count on to get you out of trouble every time. There were moments he succeeded and times he didn't, but he never really gave up. And his refusal to get flustered (on and off the field) despite immense pressure has seen him win more games than he has lost. In the last few years especially, I have felt many a time that even if 1/3 of the members in the team were endowed with such an attitude, Team India would be playing a different ball game altogether. Can you think of another instance, another bowler bowling 14 overs with a broken jaw despite doctor's advice against doing so? I have always believed that in this country Kumble never got the recognition and acclaim that he truly deserved. Despite all his achievements, his name has always been mentioned as an after-thought, his accomplishments seemingly subsumed by those of Tendulkar, Ganguly or Dravid. It probably has to do with the nature of media and fans in this country where the batsmen always seemed to get more ovation than any of the bowlers. Remember Gavaskar vs Kapil Dev? Or probably it has to do with the way Kumble's career actually took off: in 1990 when a studious-looking Kumble made his career against the English team, Tendulkar made his first century thereby stopping England's path to victory. In Tendulkar's blistering ton, the leg spinner was all but forgotten. No wonder, despite being a match-winning bowler for over a decade, despite his enormous talent and vast experience Kumble was always given a raw deal, especially in his own country. 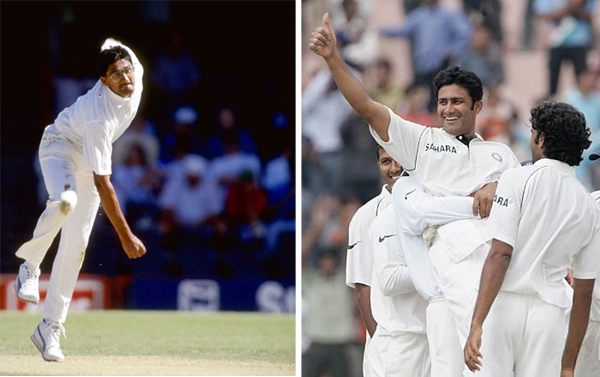 Anil Kumble is currently the highest wicket-taker for India in both One Day International and Test matches, having taken over 500 Test wickets and 300 ODI wickets. He is one of only two bowlers ever to have taken all 10 wickets in a test innings. Yet, to me it seemed as though Kumble was never too worried about the accolades that came (or rather didn't come) his way. The brickbats, every time he failed, I am sure hurt him. He reinvented himself again and again, trying his best to overcome his so-called limitations as a spinner. They said he could perform only on Indian tracks; one look at statistics and you know they are wrong. They said, like McGrath, he was robotic; that he got wickets because he was clinical; why, I ask, is McGrath for the very reason considered a great bowler but Kumble isn't? When they talk of great bowlers of this country they always go back to the spin-quartet of the 70s or to Kapil Dev; yet the fact is that Kumble's wickets per match is way ahead of even Chandrasekhar, the bowler he has been compared to most often. And unlike Kapil he didn't really have to linger on for two years in order to establish/break a record. They said he was not a genuine leg spinner; I ask, does it really matter? Kumble did what he could very well, so what if he didn't fit into a groove. That despite not fitting in he turned out to be such a terrific bowler and match winner should actually speak volumes about his talent and commitment. I have always believed that Kumble had it in him to be a good captain. To many he always seemed a natural team player. But one look at how he has chartered his career - pulling himself up when stakes were down, trying hard, pushing himself to the limits, going that extra mile to ensure the best for the team, motivating himself and inspiring others to give a little more and the fact that he was always considered to be an intelligent, thinking cricketer - all this and more, I believe, would also have made him a natural leader, a lot like Steve Waugh in more ways than one. Now, of course, one would never know. And that I think is Indian cricket's loss. Talks about his retirement from the smaller version of the game have been doing rounds for a while now, ever since Kumble was officially dropped from it. And when given a chance to perform again he, even if it wasn't his best of performances, didn't truly disappoint. Not every one seizes the opportunities they get; not every one recognizes when their time is up. While Kumble's time may not necessarily be up, but in the smaller version of the game he definitely is not the bowler he used to be; the thinking bowler that he is, Kumble knows this as well as anyone else. The retirement announcement, to me, comes at the right time - Kumble hasn't been the first-pick player for a while now, and it is unlikely that is going to change. And it is always better to leave a game on your terms (remember Gavaskar, Schumacher?) rather than be asked to quit, isn't it? Yet, the next time India plays a ODI, it would be weird not to see Kumble in it. I know, he hasn't actually been playing the smaller version of the game for a while now; yet somehow there was comfort in the fact that he was there for you if required. What one is also likely to miss is Kumble the man himself. To me he was one of the last ambassadors of the game, a perfect gentleman. And in today's world when cricket (through politics, scandals, controversies and probably even murders) is being played outside the field a lot more, Kumble probably represented one of the last of the gentlemen the no-longer-gentlemen's-game has seen.